Raise a glass to Michigan varietals. According to the Michigan Grape and Wine Industry Council, Michigan wine production has doubled over the last decade and its wines are attracting ever-increasing attention. The Council mentions that last year alone, 500 national awards were bestowed upon Michigan bottles and the public is paying attention: The scenic beauty of this state’s 120 wineries and the quality of the wine they produce attract two million visitors per year. Elegant cool climate varietals such as Riesling, Gewurtztraminer, Traminette and Pinot Noir thrive in Michigan’s four federally recognized viticultural areas and Michiganders should be proud that their state was named as one of ’10 Up-and-Coming Wine Regions’ in a recent CNN article by Krisanne Fordham, included in the same company as areas in Italy, South Africa, and Eastern Europe. 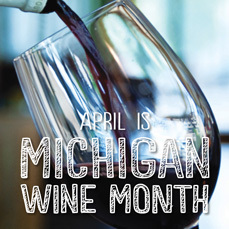 This April is Michigan Wine Month, so raise a glass and toast this state’s unique, delicious beauty today!